QUESTIONS? / MORE TECHNICAL INFORMATION? We invite you to begin a dialog with us about AdvantaPass. Please help us get to know your pass-through needs by taking a moment to fill out the form below. A technical support representative will contact you shortly to discuss your specific application. What is the thickness of your wall (measured outside to outside)? What is the material of the interior wall? What is the material of the exterior wall? What components will pass through? This will help in determining the dimensions of the AdvantaPass portal assembly. a. What is the size of the largest component? b. How many tubes will pass through? c.	What are the ID(s) and OD(s) of the tubing? d.	What type of tubing? e.	How long is the clean side tubing? f.	How long is the dirty side tubing? 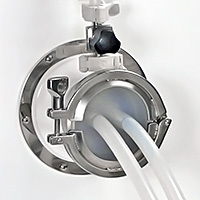 Do you require air purge ports on the AdvantaPass? How many AdvantaPasses do you think you may need? What are the dimensions of the space allotted for AdvantaPass(s)? The data gathered from this form is used to provide you with information which you have requested. It is intended for NewAge Industries AdvantaPure® internal uses only and will not be sold or knowingly shared with third parties outside of our organization and representatives. 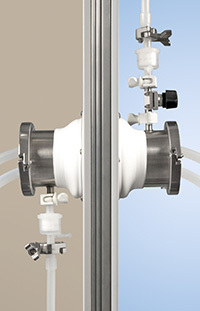 This cross section view of the AdvantaPass system shows an air purge filtering function.